A Motivating, Engaging, and Entertaining Speaker Your Attendees Will Never Forget! You have many options when it comes to hiring a motivational or keynote speaker for your corporate or association event, but if you're looking for a speaker who will create a fun, positive, memorable, and meaningful experience for your attendees, you've come to the right place. My name is Lou Serrano, and whether you need an opening speaker to wake up the crowd and energize the room, or a closing speaker to ensure your program ends on a high note, my program will get the job done. What makes my presentation different is that I'm an Audience Engagement Specialist, and my interactive demonstrations become the hook on which I hang the key points of my presentation. Instead of just listening to a presentation, you will experience it! 1. The M.A.G.I.C. Formula For Success - The M.A.G.I.C. Formula For Success is a 30 to 90-minute interactive presentation consisting of five universal principles; principles that if they were applied on a consistent and daily basis can transform the lives of your attendees from whatever it is now to whatever it is they'd like it to be. This presentation is customizable to fit almost any theme including leadership, sales, teamwork, mentorship, and more. Conferences can be long and boring, but they don’t have to be. Having the right speaker kick off the day can set the tone for your entire event. Having the right speaker close out your conference can unify all your presentations ensuring your attendees leave on a high note. As a keynote speaker and Audience Engagement Specialist, I know how to impact an audience leaving them with a lasting positive impression. The M.A.G.I.C. Formula For Success keynote presentation combines my world-class entertainment skills with a powerful message designed to transform lives. 2. Maximize Your Impact - How To Captivate, Motivate, and Inspire Any Audience I believe one of the fastest and most effective ways to grow your business or draw attention to a cause is to speak in front of an audience. It increases visibility to your business, creates instant credibility, and positions you as the authority in your field. The problem is that most people have no idea how put together a compelling and engaging presentation. Maximize Your Impact is a highly interactive 30 to 60-minute keynote presentation designed to give your attendees tools for more effective communication from the platform, whether that platform is in front of 40, 400, or 4000 people. I will share tools, strategies, and concepts that will enable your attendees to captivate their audiences in the first few vital seconds of their presentation, how to keep that attention, and then how to deliver their message in a way that inspires people to take action! Along the way your attendees will experience fun, interactive, and amazing demonstrations designed to illustrate the key point of the talk. At one point or another everyone needs to give a presentation in front of a group. Whether it's in front of your employees, colleagues, board members, prospects, clients, or in front of an association group, and the more compelling your presentation the easier it is to inspire people to take action on your ideas. After experiencing the Maximize Your Impact keynote presentation, your attendees will approach their next presentation with confidence to inspire! What To Expect When You Hire Lou. 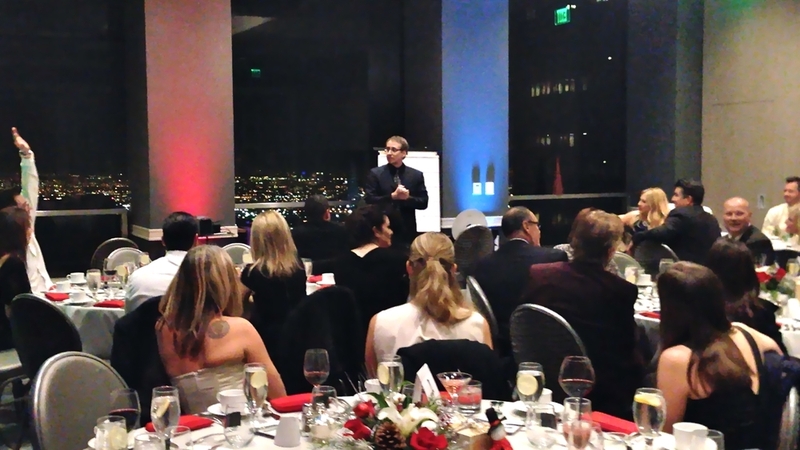 • Experience - I have over 20 years of experience as a professional speaker, and I bring all that experience to your event. • A Powerful Message Your Attendees Will "Experience" - Your attendees will witness fun and amazing demonstrations coupled with extraordinary audience interaction. The performance is designed to support the message. They won't just hear a presentation, they will experience it! • Comedy That Is Corporate Clean - There is a fair amount of comedy throughout my presentation. Your attendees will laugh and be energized, but those laughs never come at the expense of someone else. • Worry-Free Service - When you hire me, you deal directly with me. You won't speak with an agent, manager, or associate. I return calls promptly, show up on time, and I'm always ready to deliver a presentation of a lifetime. I'll work with you one-on-one to ensure my presentation meets your particular needs for your specific event.